Recently, Clutch – the leading B2B ratings and reviews platform – released a report listing the top development companies in the United Kingdom. 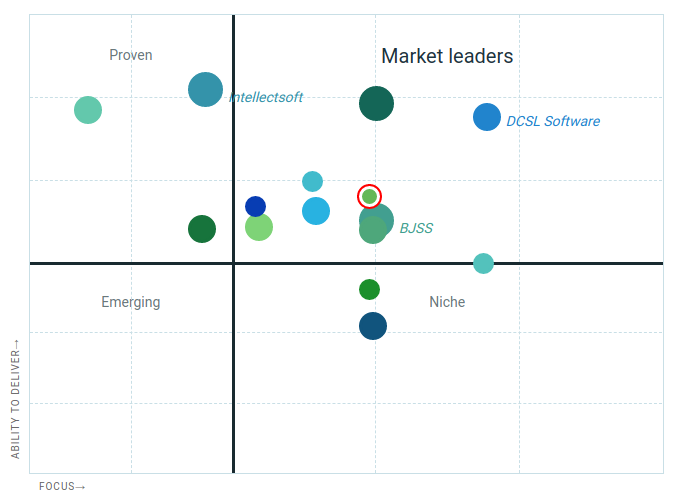 We are proud to announce that based on in-depth client feedback, Isotoma has been recognised for being one of the top software developers in the UK. Clutch uses a unique rating methodology that compares agencies and software solutions based on the services that they offer, previous work, and analyst conducted client reference interviews. Client reviews form the backbone of Clutch’s research and allows business buyers and sellers with the insight they need to facilitate productive business partnerships. Their research is displayed using a leader’s matrix that considers a company’s ability to deliver, clients and experience, and market presence. Isotoma is listed as a top 5 software development company in the UK. Take a look below! Isotoma was also featured as a top web development company in the UK. Since joining Clutch in December, 4 of our clients have taken the time to review us on the ratings platform. Our clients came to Isotoma with high-level requirements for their projects and Isotoma ensured that our clients got the best return on their investment. You can check out more case studies and sample of the work that we are capable of on our work pages. We would like to thank our amazing clients for taking the time to review us on Clutch. We are thrilled to hear such positive experiences about our development work and look forward to maintaining our standing as a leading bespoke software development company throughout 2018. You can read the full reviews on our Clutch profile. If you are interested in learning more about our highly rated services, please get in touch. This entry was posted in announce on March 19, 2018 by Andy Theyers.